From the trusted nutritionist behind the bestselling healthy cookbook on meal prep comes The Easy 5-Ingredient Healthy Cookbook - your next course in healthy meals made super simple. Keeping balanced meals on the table can be tough when you’re busy. 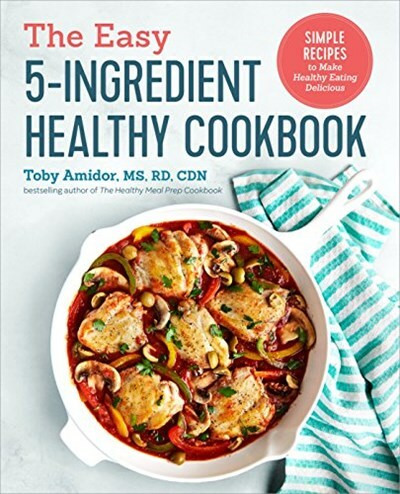 That’s why registered dietitian nutritionist and bestselling healthy cookbook author, Toby Amidor, created The Easy 5-Ingredient Healthy Cookbook. With truly simple 5-ingredient recipes - many of which are ready to eat in 30 minutes or require just one cooking vessel - The Easy 5-Ingredient Healthy Cookbook is your solution to eating healthy on a hectic schedule. A healthy cookbook with a simple solution to nutritious meals - The Easy 5-Ingredient Healthy Cookbook helps you eat well even when you’re busy.